On this day in 1945 Hammerson listed on the LSE. The following chart plots the average monthly out-performance of the shares over the FTSE 100 Index since 1988. For example, on average Hammerson has out-performed the FTSE 100 by 0.6 percentage points in May. The strongest month for Hammerson shares relative to the market has been May (the shares have out-performed the market in this month in 16 of the last 24 years). The weakest month for Hammerson relative to the market has been September (the shares have only out-performed the market in this month in 10 of the past 25 years). Hammerson is in the FTSE 350 Real Estate Investment Trusts [NMX8670] sector. Since 1984 the market has on average risen 0.08% on the LTD of May, which makes it 8th in the ranking of month LTDs. Since 2000, however, it has been the 4th strongest month LTD, with an average return of 0.17% on the day. On this day in 1994 Redrow listed on the LSE. The following chart plots the average monthly out-performance of the shares over the FTSE 100 Index since 1994. For example, on average Redrow has out-performed the FTSE 100 by 6.1 percentage points in August. The strongest month for Redrow shares relative to the market has been August (the shares have out-performed the market in this month in 15 of the last 19 years). The weakest month for Redrow relative to the market has been May (the shares have only out-performed the market in this month in 6 of the past 18 years). Redrow is in the FTSE 350 Household Goods & Home Construction [NMX3720] sector. The chart shows that on average the market trades fairly flat for the first two weeks of the month, the third week sees a sell off, with final bounce back in the last few days. The average chart for April was posted a month ago here. The following reproduces that chart and overlays the actual FTSE 100 for April 2013. In an average April the market climbs steadily throughout the month. This year, the market started weak, then recovered during the latter half of the month. We are heading into the weakest two-month period in the year for the stock market. 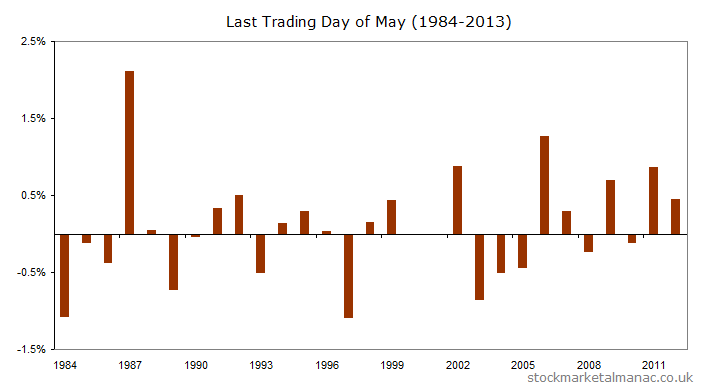 There are only three months where, since 1970, the market has an average return of below zero – May is one of them (the others are June and September). On average the market falls -0.3% in the month, and the probability of a positive return in the month is below 50%, at 45%. 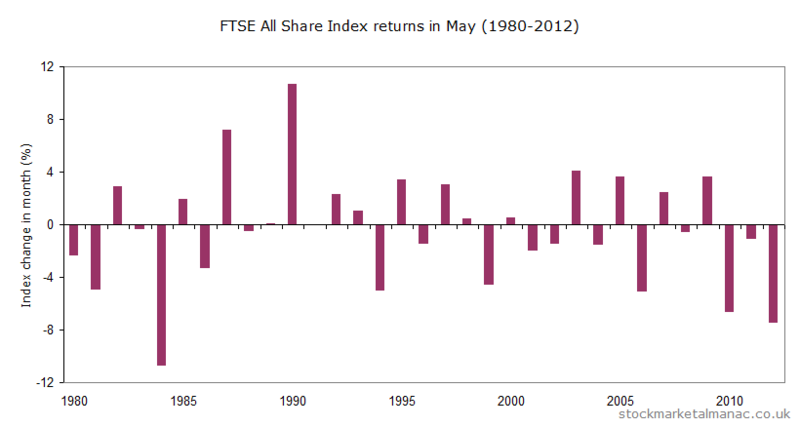 The accompanying chart plots the percentage performance of the FTSE All Share Index for each May since 1980. For example, last year in 2012 the market fell 7.5% in May. As can be seen on the chart, the market has had a greater propensity to fall rather than rise in recent years. So, generally, market performance in May justifies the saying, “sell in May and go away”. May is the start of the weaker half of the year (historically the market over November to April greatly out-performs the period May to October). Some short-term investors, therefore, tend to reduce exposure to the stock market from May. Internationally, May is the weakest month of the year for the FTSE 100 Index relative to the S&P 500 Index; on average the UK index under-performs the US by 1.4 percentage points in May. Strong sectors relative to the general market in May tend to be Gas, Water & Multiutilities, Food Producers, Tobacco, and Electricity; while the weaker sectors are: General Industrials and Life Insurance. At the stock level, an interesting company this month is AVEVA, which is the only stock in the FTSE 350 Index that has risen in nine of the past ten years in May. 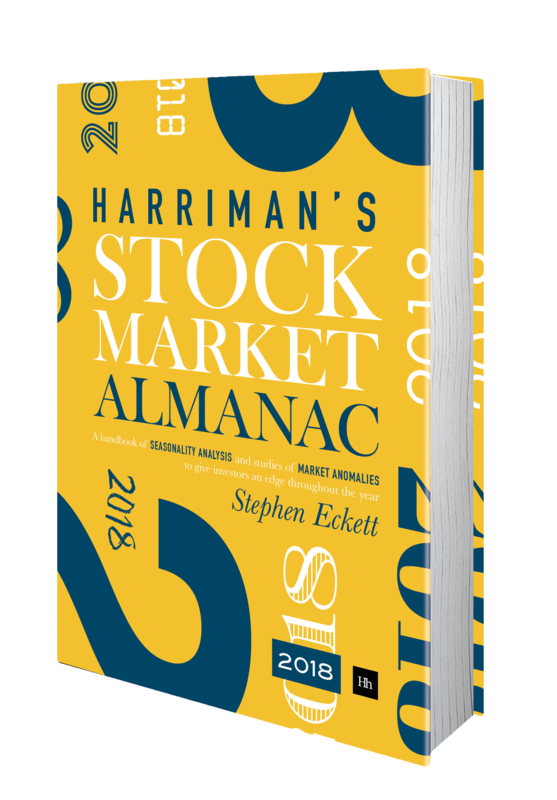 Conversely, the worst performing stocks in the month have been Old Mutual, Workspace Group, and Barclays, all of which have fallen in nine of the past ten years in May. On the economic front, the MPC will make its interest rate announcement at 12 noon on 9 May. Any changes to the MSCI Index will be announced on 15 May in its semi-annual review (such reviews can have an interesting effect on stocks). And be aware the London Stock Exchange will be closed 6 and 27 May. Finally, for those of an astrological bent, there will be an annular solar eclipse on 10 May and a penumbral lunar eclipse on 25 May. Of course, there can be no rational connection between the lunar calendar and the stock market, but research on recent data shows that the market does tend to be strong on days with a full moon!